There was an interesting lead up to this race that I posted about for the past couple of weeks. 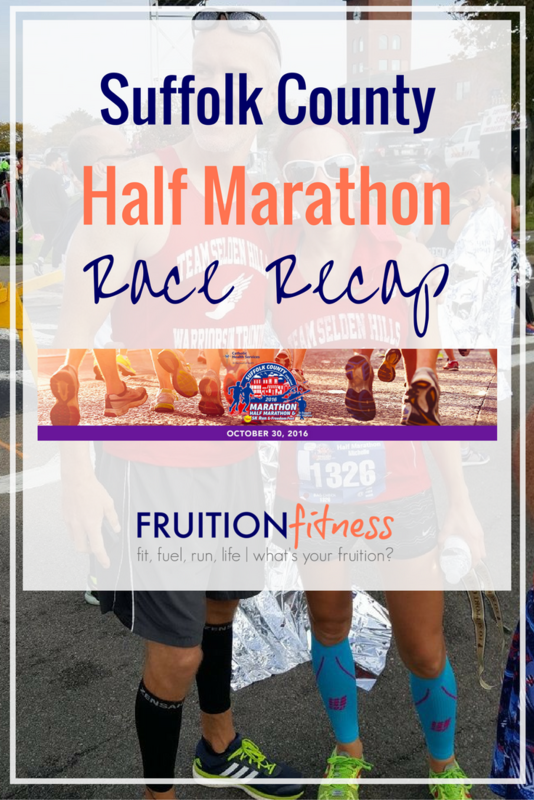 If you’d like to be brought up to speed before diving into the recap, you can check out last week’s post on The Top 3 Ways to Have Fun During a Race, and/or the week prior to that where I weighed my options of whether I would actually run this race or not. I don’t want to use the word nervous to describe what I was feeling, but I think I was mainly in disbelief that I was about to embark on a half marathon. 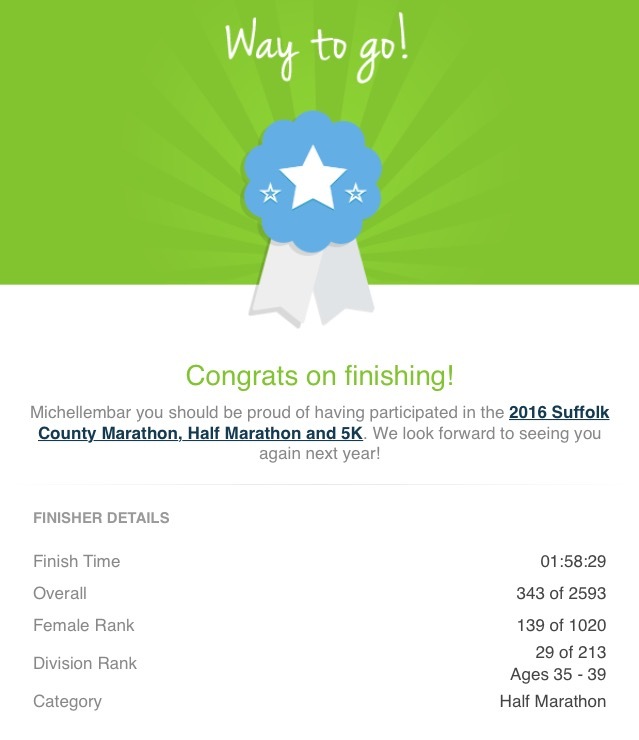 I haven’t run a race of significant distance since last year’s Suffolk County Marathon (I trained hard and did the full in the end of September last year), and as we know, my training coming into this race was less than adequate to feel confident. I decided to check my goals at the door and run for fun. Before the race started we (my husband did the 5k plus some more mileage before NYC next weekend!) mingled with some runner friends we haven’t seen in awhile and took in the race atmosphere. In addition to being a month later, the 2nd Annual Suffolk County Marathon, Half Marathon and 5k moved towns as well. This year, instead of having its home base in a state park, Patchogue shut down their section of Main Street to traffic and moved all the businesses, restaurants, and vendors outside for a party. It was a great street fair atmosphere with music, activities for kids, and plenty of food and drinks–and the weather was perfect. This whole package definitely helped my ‘have fun’ mentality. If it were rainy and cold, I’m not sure how much ‘fun’ I would’ve had. 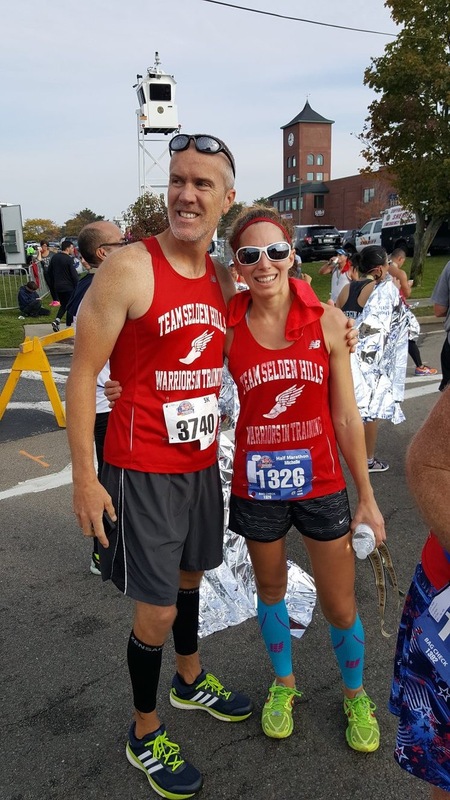 I positioned myself in a group of Selden Hill Warriors, not concerned with any pace markers at all. When it was time to go, we all started slow and eventually opened up after crossing over the starting mats. When the crowd cleared I found a great running friend that I haven’t talked to in ages. For the first two miles, we talked and caught up on work, kids, running, and life–it was perfect. After we split up though, I found myself alone. I didn’t have a watch on, so I had no idea what my paces were aside from the timing company’s mile markers. So remember last week when I was all about fun, and selfies, and chatting with friends? I managed to do that for only the first two miles. When I found myself running alone (which I tend to do normally), I focused on maintaining a comfortable pace that I knew could carry me throughout. I actually felt really good. It was warm, but I was dressed appropriately and was not overheating at all. These miles went pretty quickly and smoothly, but in the back of my mind I knew there was a lot more ground to cover. I grouped these miles together because this is where I really started feeling the lack of training. A common misconception is that lack of training equals lack of speed. But really, the worse problem is how lack of training affects your strength, which in turn affects your form, which in turn could lead to injuries. Part of the reason I decided to do this race is that I am not injury prone, and luckily that still holds true, but I definitely was sore from calling on unconditioned muscles to do more than they were ready for. During this stretch I also started to panic slightly in regards to nutrition. I typically don’t run with my own nutrition, instead relying on what is on the course. I didn’t really think about anything other than water until mile 6. I knew my running club’s aid station was coming up at mile 7 and planned to take whatever electrolytes they had. I had some Gatorade which did the job, but did not sit well in my stomach (lately I’ve been loving Nuun). Luckily I was able to run it off, but stuck to water for the remainder of the race. In my head (even in the last segment), I was breaking the race down into stretches of town. The race is really just an out and back on Main Street, and being very familiar with the course meant I could break it down into attainable segments. This is also the stretch where I really started to get tired. I knew from my mile splits that I was negative splitting, but wasn’t sure that I could keep that up. In the back of my head, that 2 hour mark popped back up as something that was totally attainable, and knowing that I would be pretty close made me push just a little harder. As I approached the last mile, I gave everything I had left–and there wasn’t much because I actually ran a super consistent race. I was thrilled to see my time as I crossed the finish. I’m proud, humbled, but also very grateful that my body can just go out and accomplish something like this on minimal training. Even though my PR is much faster, I’m really proud of this race–it’s a great reminder of why I run. 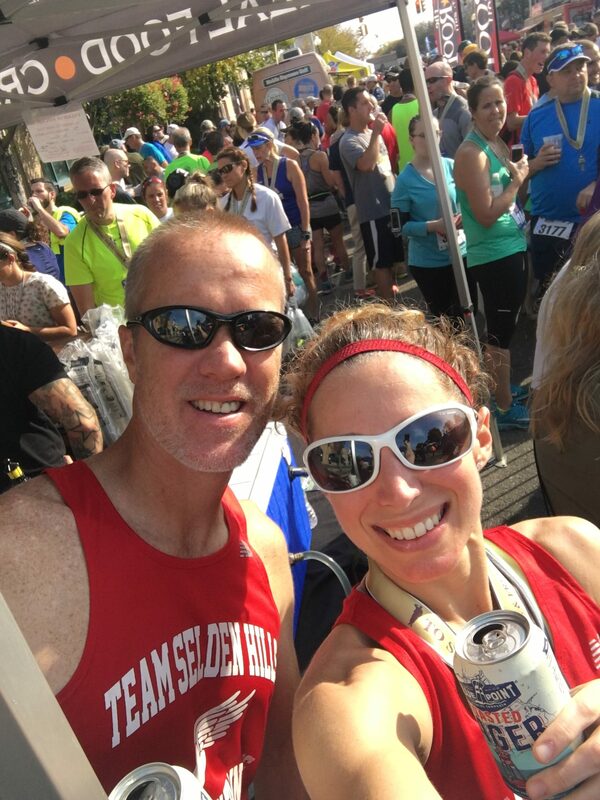 Remember, I would never recommend anyone go out and run a half marathon untrained–that was not my intent with this race either–but when I found myself already signed up, I had a decision to make. This race definitely makes me want to train for an a race again, and I’m already thinking about some springtime goals. I’m not going to be impulsive and sign up yet, but as the months go by, I’ll assess whether or not I can realistically train for some of these events. And to commemorate this weekend’s NYC Marathon, I have to post my 15 minutes of fame picture as I do every year! These were the days where I capped off an amazing 2013 season of triathlons and running with a marathon PR and picture that would be plastered over billboards. Click here to read more about my 15 minutes of fame. I hope to give you some feedback about Lance’s experience next week! that is a HUGE 15 minutes of fame, how cool!!!! and congrats on a great race even if it wasn’t the most planned…that’s awesome! Thanks!! That year was crazy when everyone started sending me pics of myself all over the city! Very exciting! NAILED IT! And a little fame to go along with?? A banner day, lady! Thanks!! I’ll be reposting that every year until I’m 100. Congrats, Michelle! Way to play it smart and rock the race at the same time! Thanks! I’m very happy with how it all played out! Ha! I had a feeling your run for fun would go out the door. Competitiveness takes over quickly in a race. Congrats on an amazing race though. Haha, you know me too well! Thanks! Thanks! I really felt all my weak muscles while I tried to keep up my good form, but I felt it failing! I would NOT have done the marathon like this. Nice job! That’s a great race considering your lack of training. You must be so proud of yourself. Also, Gatorade — no bueno!! Too much sugar for my gut, too. I stick to water or SOS or Tailwind. Usually just water. I am very proud! I wasn’t totally expecting to break 2 hours. When I actually prepare for a race I’ll bring my own hydration! A sub-2 is pretty awesome for not being trained! Way to go! 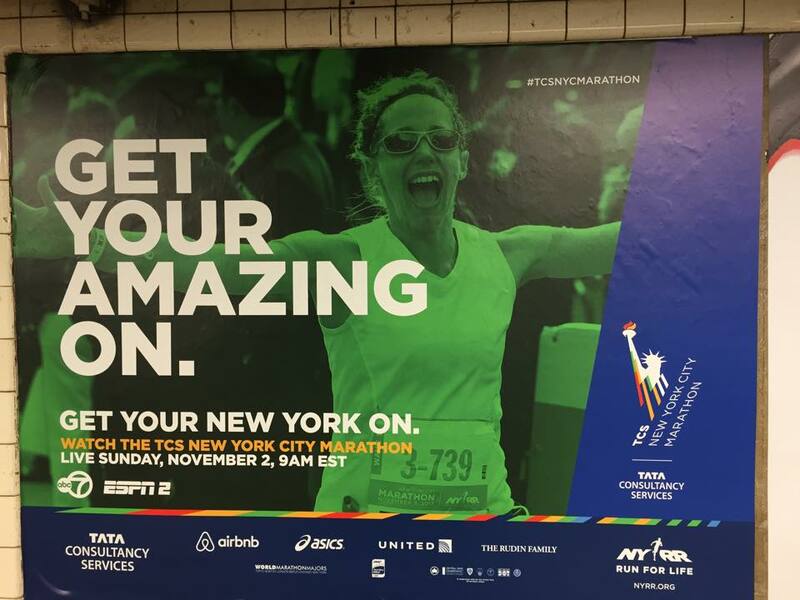 And I’ll always love that NYC Marathon poster! Thanks!!! I am a little sore, but it went really well! Congrats on your race! You did a great job, and I’m glad that it went well in the end, despite not being your fastest race. Good luck to Lance this weekend! Thanks! Hopefully he has a good experience as well!